It's no secret that we live in a very, very small apartment. I love our home, but it gets zero points for storage space. 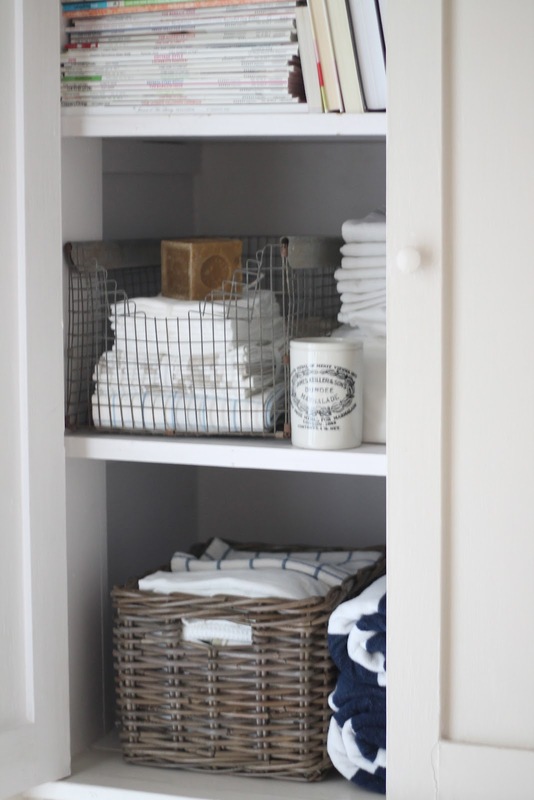 Besides our rather small bedroom closets, the only storage available is this built-in linen cabinet. I am so thankful for it, because it does provide a fair amount of space to hide things like craft supplies, lightbulbs, linens, etc. But since it's basically our only storage, it was getting a bit crammed and completely disorganized. Every time I opened the doors it seemed like I had to go digging for what I was looking for. Well, I could only take that for so long. I decided a good cleaning and organizing session was in order, and got to work sorting out the closet. The cupboard also doubles as a book case, so the top shelf remained devoted to my collection of decorating magazines and our books. One of my favorite tricks for creating a neutral palette is simply to turn books with the pages facing out, instead of all the colored spines creating visual noise. 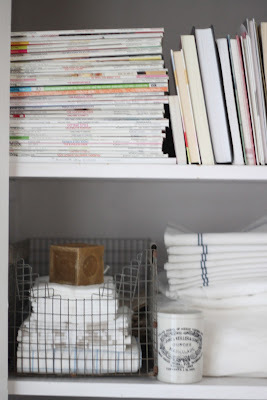 If you need to find books quickly, it might not be the best solution, but if you only choose books occasionally it really helps to declutter the look of your book storage. 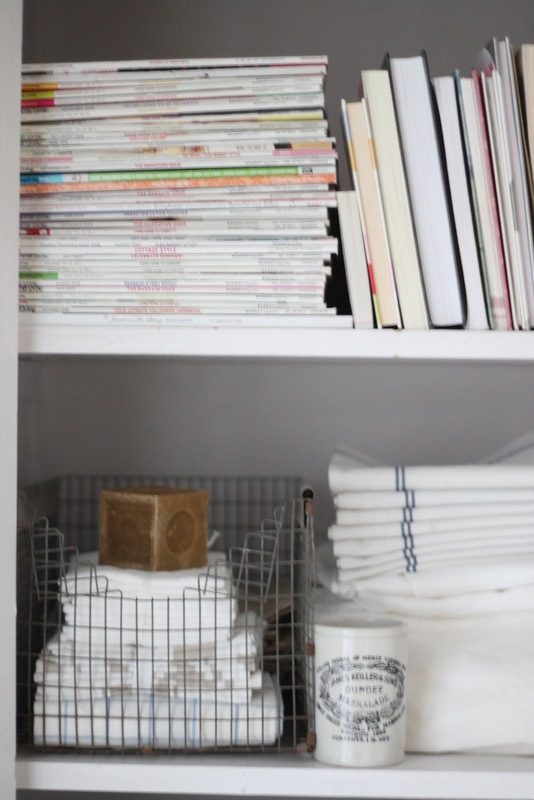 The middle shelf holds our table linens, bed sheets and cleaning supplies. 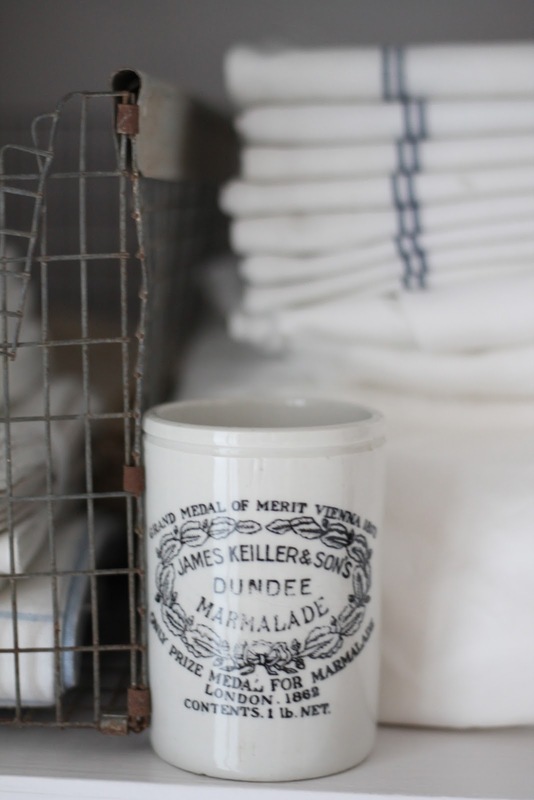 The wire basket on the left came from a local vintage shop and is one of my favorite finds. I had been looking for something like this for weeks and couldn't find anything just right for under about $25. This one was $12.95, is very long and roomy, and I love the curved opening in the front. I keep our bed sheets in one of the pillowcases so they are not separated. 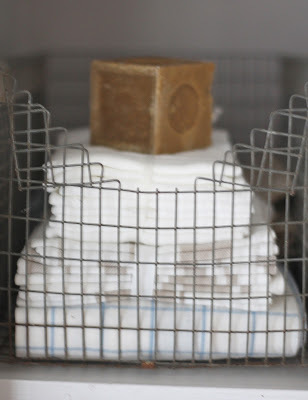 This is a wonderful trick for storing sheets I picked upon Pinterest. 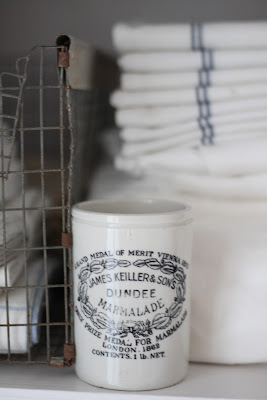 I use one of my favorite marmalade jars to catch small loose items like buttons and safety pins. 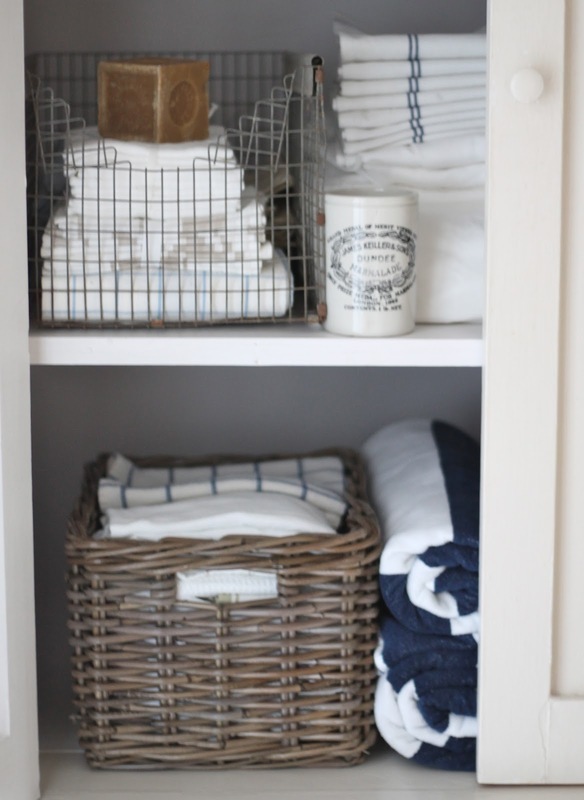 I have a bit of an obsession with tea towels, so I bought two gray wash willow baskets from Target to contain my ever-growing collection of kitchen linens. Luckily this is one collection that gets used on a daily basis. 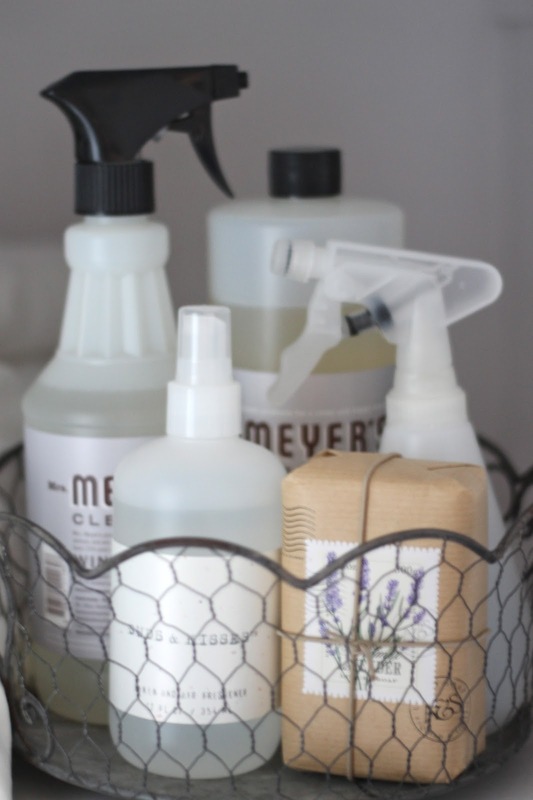 Cleaning supplies, soap and linen spray corralled in a pretty basket. 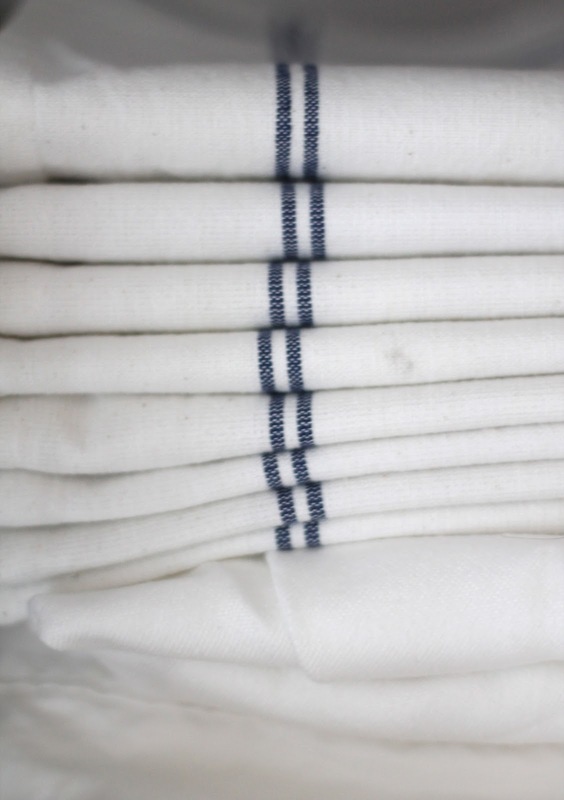 These blue striped linens are placemats. You'd never guess but they are actually from the Dollar Tree! I loved their white canvas material with a French/Scandinavian blue striped border. And you just can't beat the price! 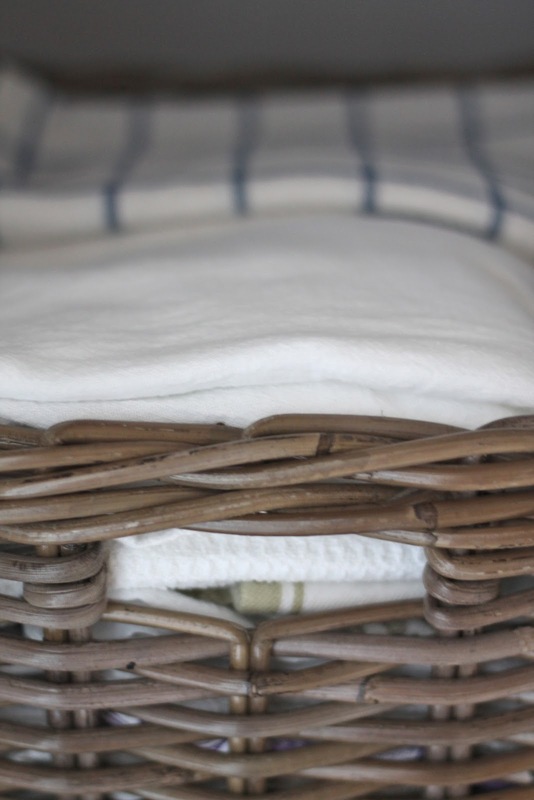 Our blue stripe beach towels sit between the two willow baskets so they're easily accessible when we head to the pool - a common occurrence during this hot summer! 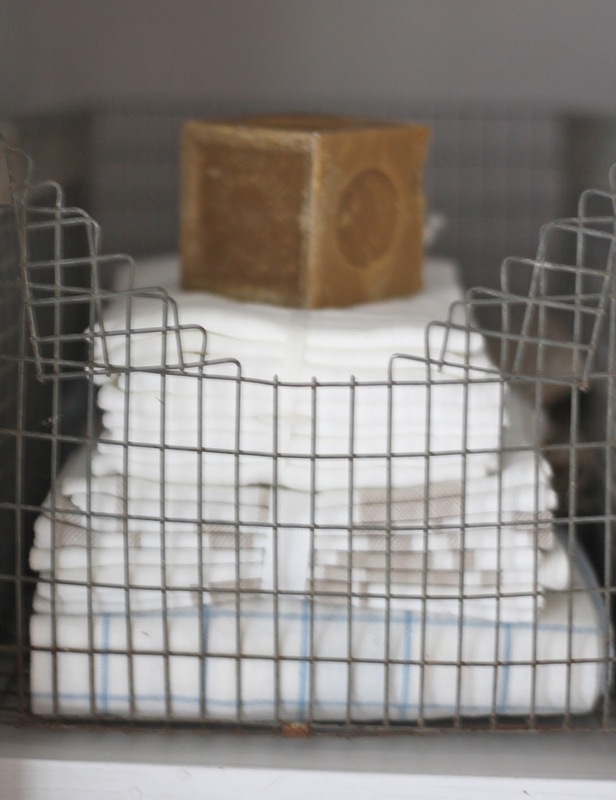 It feels so good to have a pretty, organized storage space. 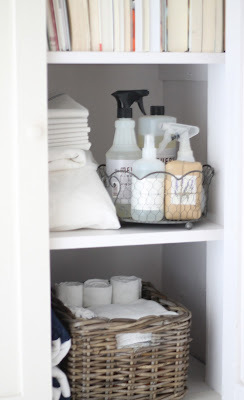 If you have a space that needs organizing, my top advice is to group like items together for visual impact. 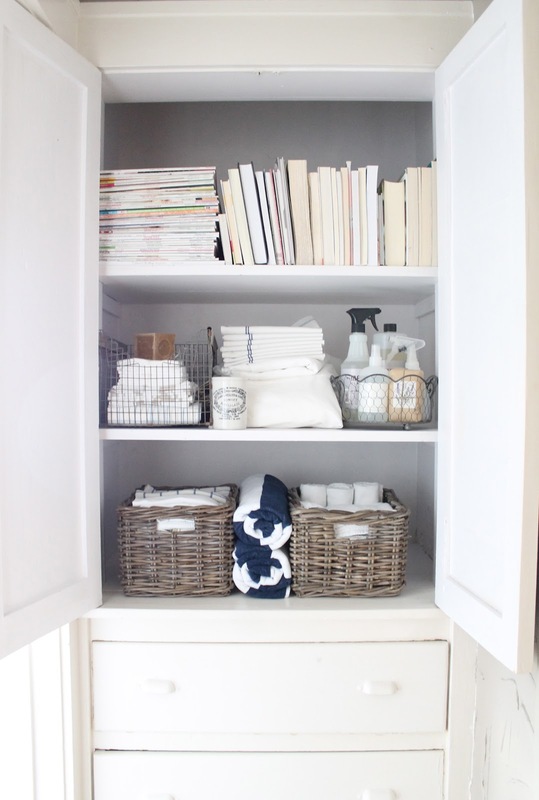 Then, use baskets, boxes and other storage items to corral groupings and create separation. 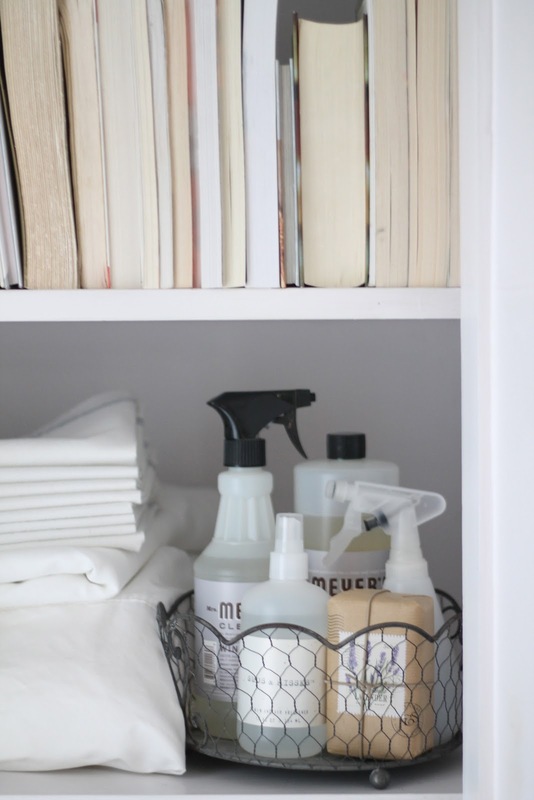 It really is that easy to organize and beautify a storage space! PS- I got lots of inspiration from my Pinterest boards. 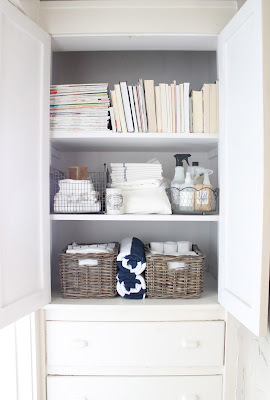 Click here or here for tons of pretty, organized inspiration. I'm linking up with Jennifer Rizzo this week. beautiful job - I love that cupboard!!! 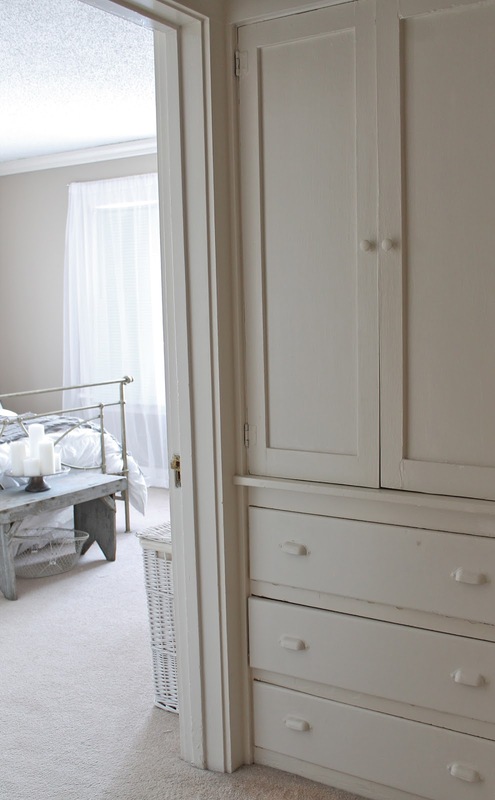 your cupboard is so pretty! I love all the baskets you have stored things in. Makes me jealous! :) Thanks for sharing! That's one of the issue sadly with apartments. I try to store my stuff at my friends house. that makes it easier on me. Great linen closet! 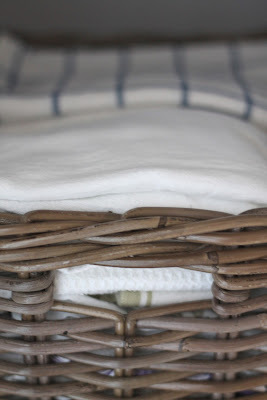 Your round wire basket with the scalloped edge is adorable! Would you mind sharing where you got it?